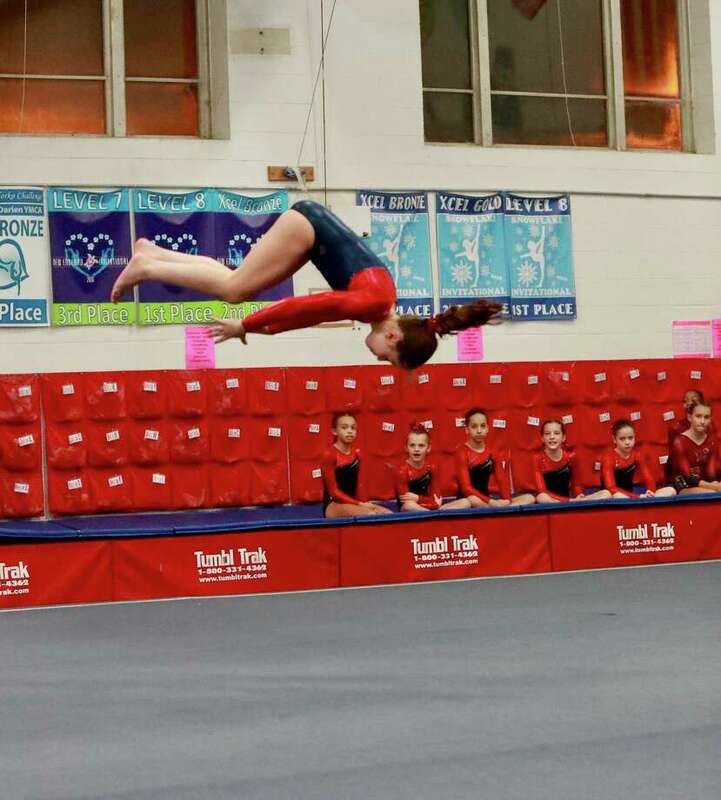 With her teammates cheering her on, Darien YMCA Level 6 gymnast Anna Altier (New Canaan) flipped to a huge 9.4 score to win the floor title at the New England Invitational. The competition season may have just begun, but the Darien YMCA gymnastics team was right back to their winning ways at the 2017 New England Invitational in Glastonbury, capturing five team championships and 15 individual All Around (AA) titles. Gymnasts competed by level and age group. Though Darien had been absent from the Level 8 competition scene for a while, they returned with a bang, taking the team title by a five-point margin. Sofia DeStefano paced the squad, taking first AA in the Junior group and placing second on vault and third on all other events. Saskia Chermayeff swung to the bars title and was second AA and fourth on beam and floor. Leilani Nguyen earned third on vault and AA and was second on bars and floor. Nadia Borja vaulted to the top of the podium and was second on beam and fourth AA. Sarah Cross soared to the floor title with a huge 9.6 and was fourth on bars. Tori Ware never wavered on beam, taking first with 9.6 and was fourth on vault. Bella DeStefano flipped to a 9.05 on floor. Gianna Cardini and Adnerys DeJesus were the sole Level 9 and 10 competitors in the meet. Highlights for Cardini were floor and vault, where she scored a 9.0 on her Tsuk vault. DeJesus also soared on vault, scoring 9.2 and hit solid routines on all other events. The champion Level 7 team was led by Sofia Iuteri, who won the AA for the 10-12 age group with a huge 37.90 along with the vault, bars and beam titles and placed fourth on floor. Anna Moss flipped to first on floor with 9.5 and placed second on beam and AA, third on vault and sixth on bars. Emma Kelly took second on vault and bars, fourth on beam and third AA. Olivia Perkins scored 9.6 to win the vault title in the 13s group and placed third on floor and fourth on beam. Lucy Collins topped the podium in four events in the 14s group, winning vault, bars, beam and AA and placing second on floor. In the 15 and up group, Lana Schmidt took first on vault and AA and was second on floor, third on beam and fourth on bars. Kaitlyn Moussignac was the beam champ and was second on vault, and third on floor and AA. Kerry McDermott placed second on bars and fourth on beam, vault and AA while Lily Fairleigh earned second on beam and third on bars. Anna Altier paced the first-place level 6 team, sweeping the event titles and the AA with 37.675 in the 8-11 group. Julia Decsi placed second on vault, fourth on bars, sixth on beam and fifth on floor and AA. Anna Primmer placed fifth on vault and beam, fourth on floor and sixth AA while Lauren Smith flipped to third on floor. In the 12s group, Abigail O’Brien topped the podium on bars, floor and AA with 37.00 and was fourth on beam and tied for second on vault with teammate Melina Cardini. Cardini was also second on beam and fourth on floor. Megan Mitchell scored second on vault, beam and floor in the 13s group, as well as third on bars and AA. Sommer Schmidt earned third on vault and fourth on bars, beam and floor. The Level 5 squad took second in a closely contested team competition. Alexa Bell was the AA champ in the 9-11 group, as well as second on vault and floor and tied for third on beam with teammate Sophie Root. Ellie Davies topped the podium on beam and floor with 9.5 and 9.25, and placed third on vault and second AA. Tanner Generoso vaulted to first and was fifth on bars, third on floor and fourth AA. Ava Licata took fourth on vault and floor and fifth on beam. Stella Nehro led the Level 4 team champs, placing first on vault, bars, beam and AA with 37.40 and second on floor in the 10 Junior group. Mina Leon took fifth on floor, sixth on beam, fourth AA and second on bars and vault where she tied with teammate Katie Primmer. Katie Cutler earned third on beam, fourth on vault, eighth on bars, ninth on floor and sixth AA while Madeleine McGivney earned her meet high score on floor. In the 7-9 group, Emily Rizzi scored a full house of medals, taking first in three events — vault, bars and AA — and second on beam and floor. Kayla Koproski flipped to first on floor with 9.15, placed second on vault and AA, fourth on bars and seventh on beam. Emily McKee earned third on floor, fifth on bars, sixth on vault and fourth on beam and AA. Olivia Davis never wavered in winning beam with 9.6 and was also sixth on bars. Tess Hennigan had a solid meet for third on bars and beam and sixth AA. Ava Telgheder took sixth on beam and fourth on vault and floor. Regan Famigletti was the beam champ with 9.25 in the 10 Seniors, as well as fourth on bars, third on vault and AA and seventh on floor where she tied with teammate Alex Kuras. Kuras also swung to third on bars, took fourth on beam, fifth AA and sixth on vault. Shayna Moeller earned ninth on bars and floor. Reilly Costello captured three titles in the 11s group, winning vault, beam and floor and placing second AA and ninth on bars. Bella Koproski was third on beam, vault and AA, sixth on bars and second on floor. Bowen Burns took fourth on beam and seventh on bars, AA and vault where she tied with Annelise Enters. Jordan Moss earned her meet high score on floor. In the 12 and up group, Chloe Sernick was second on vault and floor, fifth on beam and sixth AA. Alex Decsi swung to second on bars and fifth on floor. Mia MacDonald earned fifth on vault, sixth on floor and seventh on beam while Alannah Morris was sixth on vault and seventh on bars. The team champion Level 3 gymnasts kept up the winning ways, with Jacquelyn Coppola sweeping the events and the AA with 36.30 in the age 6-7 group. In the 8s, Avery Hansen was third on bars and second on beam, floor and AA and fifth on vault where she tied with Penelope Hahn. Hahn was also fourth on beam and sixth on floor. Taylor Davies scored an impressive 9.6 for first on beam and was fourth on floor and sixth AA. Tatum Jaroch also hit the medal full house, topping the podium on beam, floor and AA with 37.35 and taking second on vault and bars in the 10 Junior group. Tanner Shanley placed fifth on vault, bars and beam while Kaia Woodman earned her meet high score on vault. In the 10 Senior group, Catherine Travaglini took four out of five events, winning vault, bars, beam and AA with a 37.60 and placing third on beam. Hannah Dudek swung to sixth on bars. Emma Bookless captured the vault, floor and AA titles in the 11 Junior group along with second on beam and third on bars. In the 12 and up group Meghan Canavan was champ on beam and floor, third on vault and bars and second AA.